Why choose a Curtain Wall? Curtain wall allows the flexibility for wide expanses of glass wall, and if it can be engineered, we can do it. We have assembled a team of experienced craftsman that have been trained to the intricacies of a curtain wall system. Regardless if it’s a standard system wall from a usual curtain wall manufacturer, or if it’s a custom designed system uniquely extruded, it will be expertly installed to industry standards. Unitized curtain walls entail factory fabrication and assembly of panels and may include factory glazing. These completed units are hung on the building structure to form the building enclosure. Unitized curtain wall has the advantages of: speed; lower field installation costs; and quality control within an interior climate controlled environment. The economic benefits are typically realized on large projects. Stick-built glass facades are an economical method of curtainwall construction where much of the fabrication and assembly takes place in the field. Mullions of extruded aluminum may be prefabricated, but are delivered as unassembled "sticks" to the building site. The mullions are then installed onto the building face to create a frame for the glass, which is installed subsequently. 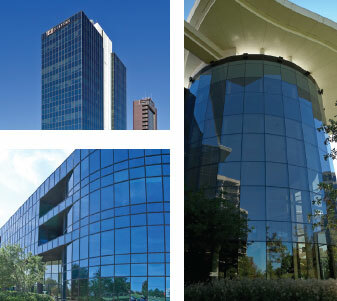 Economical off-the-shelf stick curtain wall products are available from various manufacturers that may be suitable for a wide variety of applications. If the project is on a fast track schedule, stick built curtain wall can be assembled at the project site and large framing sections craned into place on the building. This method can drastically improve project installation duration. Custom Entry Applications incorporating revolvers, automatics, all glass, clad entrance systems.